"Six men have been arrested over the killing of a woman who was found dying in a London street with one of her hands cut off." "The victim's estranged husband is among those arrested." "Mother-of-two Geeta Aulakh, 28, was attacked in Greenford, northwest London, on Tuesday as she made her way to her childminder's home. " "She was found with head injuries and a severed hand, according to witnesses. " "A friend said: 'It's horrific but hugely symbolic that Geeta's right hand was cut off. She was a Sikh and all Sikhs wear a metal bangle, the kara, on their right wrist. It is a permanent reminder to live a moral and good life and once it's on you can't get it off. 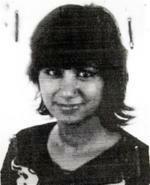 So her murderer was both dishonouring her and perhaps tryingto show she had been dishonourable - which is just barbaric.' "
"Orchard Park police are investigating a particularly gruesome killing, the beheading of a woman, after her husband — an influential member of the local Muslim community — reported her death to police Thursday." "Muzzammil Hassan is the founder and chief executive officer of Bridges TV, which he launched in 2004, amid hopes that it would help portray Muslims in a more positive light." Wow. As Robert Spencer says, "...now that he has beheaded his wife, I'm afraid this prominent moderate Muslim will only be feeding those negative perceptions." Daniel Pipes followed NY-based Bridges after its launch and has a listing of articles about it here. A New York Sun article from 2006 wrote about the Bridges network programming, noting that the station presented a variety of Muslim community leaders and scholars. Jesus went to the Mount of Olives. But early in the morning he arrived again in the temple area, and all the people started coming to him, and he sat down and taught them. Then the scribes and the Pharisees brought a woman who had been caught in adultery and made her stand in the middle. 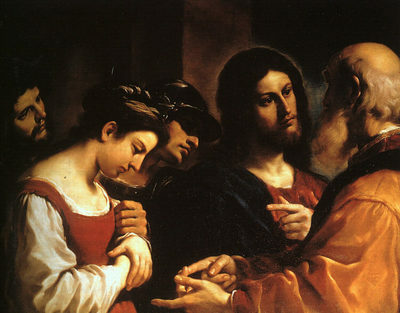 They said to him, "Teacher, this woman was caught in the very act of committing adultery. Now in the law, Moses commanded us to stone such women. So what do you say?" They said this to test him, so that they could have some charge to bring against him. Jesus bent down and began to write on the ground with his finger. But when they continued asking him, he straightened up and said to them, "Let the one among you who is without sin be the first to throw a stone at her." Again he bent down and wrote on the ground. And in response, they went away one by one, beginning with the elders. So he was left alone with the woman before him. Then Jesus straightened up and said to her, "Woman, where are they? Has no one condemned you?" She replied, "No one, sir." Then Jesus said, "Neither do I condemn you. Go, (and) from now on do not sin any more." Stoning women to death (lapidation) for adultery is alive and well in several countries today, including Nigeria, Iran, Sudan (two women were sentenced to death by stoning six days ago), Afghanistan and Pakistan, countries where Islamic sharia law has been adopted as state law. In some cases, such as Nigeria, the government has declared stonings to be unconstitutional, but they are still carried out as a "cultural" tradition. "Coming to the issue of stoning to death as a punishment for married adulterer and adulteress.... It is to be made crystal clear that the punishment is explicitly sanctioned by both the Qur’an and the Prophetic Tradition. Before explaining this further, it’s to be stressed that such punishment should not be a cause of wonder, especially when we know that it had been there in the Divine Scriptures revealed before the Glorious Qur’an. There is a reference to this punishment in the Bible, for instance. It reads: "If a man is found sleeping with another man's wife, both the man who slept with her and the woman must die." (Deuteronomy 22: 22) and also in Leviticus, we find the following verse:"If a man commits adultery with another man's wife-with the wife of his neighbor-both the adulterer and the adulteress must be put to death" (Leviticus 20: 10)." "Ibn Qudamah wrote: 'Muslim jurists are unanimous on the fact stoning to death is a specified punishment for married adulterer and adulteress.' "
Al-Bahuty said: 'The authentic practice of the Prophet (peace and blessings be upon him) supports stoning to death as a punishment specified for adultery.' "
"Finally, we would like to note that there are many incidents in the Sunnah and the life of the Prophet (peace and blessings be upon him) in which the Prophet stoned the married adulterer and adulteress to death. This happened in the case of Ma`iz and the Ghamidi woman. All this makes it clear that the punishment is proven and authentic and is not debatable." At the risk of insulting my Muslim readers, the contrast between Jesus and Mohammed is rather striking on this matter. If Mohammed is the perfect model for all mankind an for all times, and is he himself stoned women to death for adultery, then how will Muslim cultures be able to stop the practice of lapidation? What will the basis be? Write a message to the Parliament of Sudan. Contact the International Commission of Jurists. They have the expertise, resources, and legal firepower to persuade the government of the Sudan. No, I'm not saying there's anything defensible about honor killings. However, other folks in courts in Israel and Canada are asserting that honor killing is an "Arab tradition" or "Muslim cultural belief," attempting to avoid murder charges or reduce their sentence. "The Jerusalem District Court sentenced a woman to 15 years in prison for her role in the honor killings of her own two daughters...The court found the woman assisted in creating the conditions that allowed for the murder of her daughters and that she held the arms of a third daughter as the girl was attacked by her own brother....The court did not accept the defense's argument- that honor killings were a traditional part of Arab life - and identified that position as racist towards Arabs." The mother, father and son killed one married daughter because she was having an affair with an uncle. Two other two daughters were killed because they knew about the affair. "The Supreme Court of Canada declined an invitation on Thursday (November 9, 2006) to consider whether Muslim cultural and religious beliefs in ''family honour'' should be taken into account as justification for receiving a lighter sentence for killing an unfaithful wife. The court refused to hear the appeal of Adi Abdul Humaid, a devout Muslim from the United Arab Emirates, who admitted to stabbing Aysar Abbas to death with a steak knife on a visit to Ottawa in 1999. In an application filed in the Supreme Court, Humaid's lawyer, Richard Bosada, argued Humaid was provoked by his wife's claim she cheated on him, an insult so severe in the Muslim faith it deprived him of self-control.....Humaid contends his Muslim beliefs should be a factor because he killed his wife after she hinted she was having an affair with a business associate. Abbas was 46 years old when she died of 23 stab wounds to the throat in the fall of 1999, while she and her husband were visiting their son at the University of Ottawa." Fortunately, that line of thinking is REJECTED. It's astonishing to me that such defenses are even raised in court. There's a lot of work to be done. "Mohammed Saleem cut his daughter’s throat on August 11 because she refused an arranged marriage and instead wanted to integrate into Italian society. Not only did she work in a bar where alcoholic beverages were served but, worse of all, she had entered in a common law relationship with a 30-year-old Italian man. For her family, the scandal was too much to bear." Her family buried her body in the garden of the parent's house. More details here. I hope the authorities give the Saleem family the Danish treatment. Arrest the whole damn family. "Sometimes the perception of oneself as a religious person, that is, of a punctual executor of a set of rites and the attachment to a rigid and decontextualised moral code push some Muslims to blindly wall themselves up, alienating themselves from the cultural reality surrounding them. It is certain that a couple cohabiting outside an proper Islamic marriage is considered by Muslim law and tradition to be a serious sin in the eyes of God (hadd), but it is also true that no school of Islamic rights, even the strictest, has ever allowed people to take justice into their own hands. In fact, the Sharia and Islamic law restored the custom of severely punishing all those who dealt justice independently or even those who accused their spouses without the support of four fellow Muslims to testify to the adultery." (Concerning another motive for the crime), "it seems that the understanding people usually have of practising Muslims is strongly conditioned by a feeling of alienation, or incompatibility, with those which should be the values in Western society in which the defendant decided (but how freely?) to live. People still believe that a practising Muslim (and Mohammed Saleem is believed to be one) is obsessed by a scrupulous religious practice necessarily separated from considerations relating to tolerance, in the respect for personal decisions one doesn't necessarily agree with, forgiveness and the accompanying of an erring individual to help them correct themselves or convert themselves again. Nothing could be further from the truth, the features of forgiveness are in fact so important in Islamic ethics that God himself says 'My forgiveness precedes My justice....We will not stand around debating rampant Islamophobic themes (the enemy, because this is the image which must be communicated, must always be ugly, dirty and evil; why else would you wage war on him?)" Tu quoque, let's deflect some attention from that murder, shall we? Italy is guilty of Islamophobia!! I'm glad that western media is covering honor killings, but I wish they would pay as much attention to the thousands of honor killings that happen every year in Pakistan and other Middle Eastern and African countries. Like the woman I blogged about two weeks ago.